You've got the lingo, you know where to find the coupons…now what do you do? 15 copies of 5 circulars = AAACK! The first thing you need to do is to get those coupons out of the inserts. It can be very tedious, especially if you buy multiple copies of the paper each week (I know you didn't think that I was going to tell you that the actual clipping was FUN, did you?). To make it easier, I generally only clip coupons at night, after the kids have gone to bed and I am sitting on the sofa watching TV. I know that there are some people that simply create file folders and place their full inserts in each folder and only clip as you need the individual coupons. I tried that approach for one month and you know what happened? My savings (and stockpile) went down dramatically. I find that by actually going through the motions of clipping and filing my coupons helps me to know what I have. I might have a vague recollection that I have a few $.50 coupons for Valley Steamers somewhere in my pile of inserts, but if I have clipped and filed them, then I KNOW where they are because I see them every time I flip through my binder! So what do you do when you have multiple copies? Do you cut out each coupon individually? Not if you want to remain sane (or not end up discouraged because it takes so long!). The first thing to do is to grab all your copies of one insert and start pulling it apart. Create stacks of pages (tossing any pages that you know without a doubt that you don't want). Once you have all of your stack, grab 4 like-pages at a time, line them up and start cutting through all 4 pages. I like to avoid the temptation to do more than 4 pages at a time, because the pages have a tendency to shift while you are cutting, and you don't want to be cutting through your barcodes! 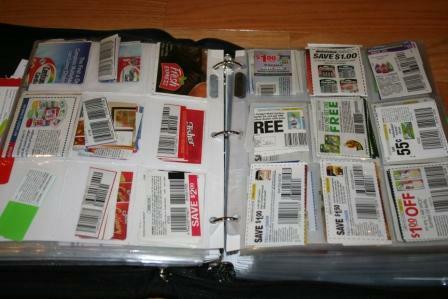 Now that you have all of your little piles of coupons, how do you organize them? Of course the simplest method (and the one that you are likely to grow out of the quickest) is the traditional 8-pocket coupon organizer that costs $1.99 (when/if you can find one). Frankly – if you are looking to save any serious money, you should just skip this method. One product that receives rave reviews is The Couponizer. The Couponizer is perfect for someone who wants to be more than just a casual couponer, but isn't quite ready to jump in to the realm of “serious couponing”. To create a coupon binder, you simply need a binder (get a zipper binder – sooner or later you will drop it and a zipper binder will keep the mess contained), page dividers, trading card pages and lots of coupons. If your zipper binder has pockets, you can throw a calculator & scissors in there. Now here's the part where you need to get over any shyness or embarrassment at using coupons. You are going to want to take this coupon binder with you to the grocery store. Why? 1. To stay organized: Go ahead and make your grocery lists and note which coupons you have, but leave those coupons in there until you actually take the item off the shelf and put it in your cart (unless you are running in for a quick trip for 1 or 2 things). Why do I say this? Because I can tell you from experience that if you pull a bunch of coupons out of your binder and head to the store, any coupons that you didn't use will NEVER find their way back in to the binder. Maybe in the beginning when you are all gung-ho…but after a few months? You'll be pulling coupons from your purse, your jacket pocket, the visor in your car…..
2. To take advantage of unadvertised sales: some of the best deals aren't even found in the circular and you want to have your selection of coupons available for when you happen upon those “Manager Specials”! 3. To spread the wealth: I usually have more coupons that I can use. Either the item isn't a pantry staple or doesn't freeze or I just don't want to get it. 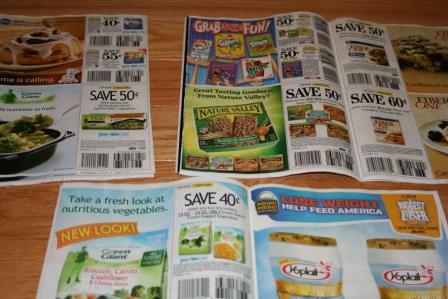 Or I bought 15 copies of the paper to get a bunch of specific coupons, but don't need 15 each of many others. I can't tell you the number of times I have handed out coupons to perfect strangers in the store when I see them grabbing something for which I have coupons. Consider it your good deed for the day! So that's Coupon Organization in a (very large) nutshell. Next Up? Not sure, but it will be up within the next 48 hours! I too get about 15-20 copies each week and my question is this…do you clip ALL of yours and keep them in one binder? Mine is pushing more than 4 inches thick and I doubt the zipper will close after I add my 15 copies from this weekend. How big is yours? One thing I forgot to mention….when buying the trading card pages, don’t get them at Staples. The pages that you can find at Target or Walmart near the Pokemon cards are both stronger and cheaper! Coupon Mommie: Eventually, I do cut all my circulars. 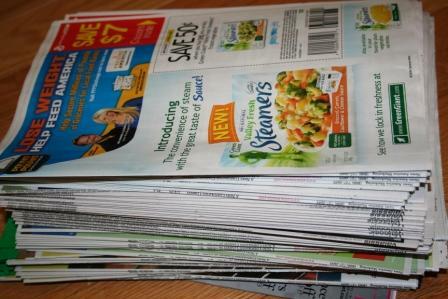 The first thing I always cut up is the General Mills SmartSource issue, because I always use most of them (although I have crescent rolls and yogurt coupons coming out of my ears!). Many times I will cut a circular in “stages”…such as if I know that there are Special K coupons in the RedPlum, I’ll grab those pages and 1 or 2 others out of each circular, cut & clip them. Then I might put that insert aside to make sure that I get the “good coupons” out of the other inserts first…then come back to the “so-so” coupons. Does that make sense? If you can convince your hubby to clip coupons, it’s a big help. Saturday night is our movie night and if I come home with more then 6 papers on Saturday morning then mine normally helps clip while we watch a movie. Only problem is, I find him clipping one page at a time. I think he did manage 3 pages at a time this past Saturday. I just posted about the need to move up to a binder. The title was “Blessing or Burden” you can read it at the following link. Serious/Stockpile Couponing is not for the faint of heart. It’s like a career and it requires time and energy. In addition I’d like to add a tip that might be helpful. I stack 3-4 like pages and put a staple in each coupon. When I cut them they don’t slide. You can see a video of how it’s done at the following link. How much of an initial investment would you say goes into purchasing a binder and baseball card holders? Stacey: I don’t know that Brad would get in to clipping coupons….but I WILL say that I have not put away anything in the pantry for quite some time. I get it for free and he puts it away…that’s the deal! Hadias: Great videos! Thanks for the links! As for the cost of the binder? My binder was an old CD binder that we had, but you can find them at Target for $10-15 (cheaper when you can find a clearance one). The trading card pages run about $10 for a 30-pack at Target. The ones at Staples are more expensive. After that, you just need dividers, which are pretty cheap in the school-supply aisle! I got the same binder as you have, Mindi, on your advice. I am glad that I did, but I do have a hard time fitting all the coupons in the baseball card sleeves (if they are too fat) so I just got some cheap 8×10 sleeves to put the oversized coupons in. It works for me. I only buy a couple papers a week (and sometimes get copies from relatives, if they remember) and it isn’t too full at all. Once you invest in the time to get it together, it is really easy and it saves time and money. A GOOD TIP: I DO take out the coupons I intend to use before I go shopping. I know what you mean about them not getting re-filed if you don’t use them. HOWEVER, I just put them in the front of my binder and I re-file them the next weekend when I’m clipping coupons. It works for me! I also look at couponing as my job. A penny saved is a penny earned! Hi Mindi! Blog is looking great. Thanks so much for mentioning my video! I really appreciate it. You have a great discussion going here with your readers. I found that the binder was a worthy investment. I have saved oodles more than the cost of the supplies. Without a good organization system, couponing is nearly impossible. And good tip on the baseball card holders! I got all mine at Walmart too. I was wondering what size of zipper binder you have, ie. is 1.5 inch big enough or perhaps it would be better to purchase a 3 inch zippered binder? Thanks for the great tips which will help me get started.